Bungie is one of the most popular and well-respected video game developers in the entire industry. They captured the heart of the gaming community with the release of the Halo series. This was later followed up with their most famous IP in 2013 - Destiny. 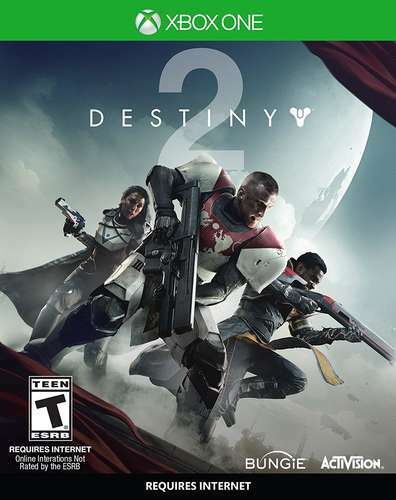 The game was so highly regarded among consumers that a sequel, Destiny 2, was released in 2017. What Does The Game Contain? Destiny 2 Xbox One is a First-Person shooter game that leads you on an epic journey through the solar system. In this cinematic campaign adventure, you customize your character’s weapons and armor to fight back and take your home. Discover lost sectors, complete new missions. Two types of play modes are available, a multiple cooperative mode and multiplayer matches mode. The game introduces a new Guided Games system. This system allows players to find like minded groups to play in activities like the Raid. An Internet connection is needed to play this game. Also there is a hard drive storage space requirement that needs to be met. Note that some functions of the game requires you to have a Xbox Live Gold Subscription. The invasion forces led by Ghaul has conquered humanity’s last secure city. They have stripped the Guardians of all their power and forced all the remaining survivors in the city to flee. Your mission is to reunite humanity’s scattered heroes and defeat the Red Legion army led by Ghaul. At your disposal is an array of sophisticated weapons to help you out. Destiny 2 offers fresh content for fans and a high level of entertainment to keep gamers engaged. Bungie’s successful track record is further proof to consumers that they are in-line for an excellent experience.